Home » News » Business Suit Breakfast "The appointment for doing business"
Against the virtual trend, nowadays quality relationships are back in the timelight. Therefore, in Bologna, it is fashionable doing business at breakfast. It's called Business Suit Breakfast. Literally: Breakfast in work clothes. In practice: a large group of entrepreneurs and professionals meets once a week, from 7:30 am to 9 am, and after coffee, cappuccino and croissant, talk about their companies, their business, exchange information, contacts and messages as well more opportunities to do business. One for all, all for one. Freely and fairly. Without compensation, percentages, fees. 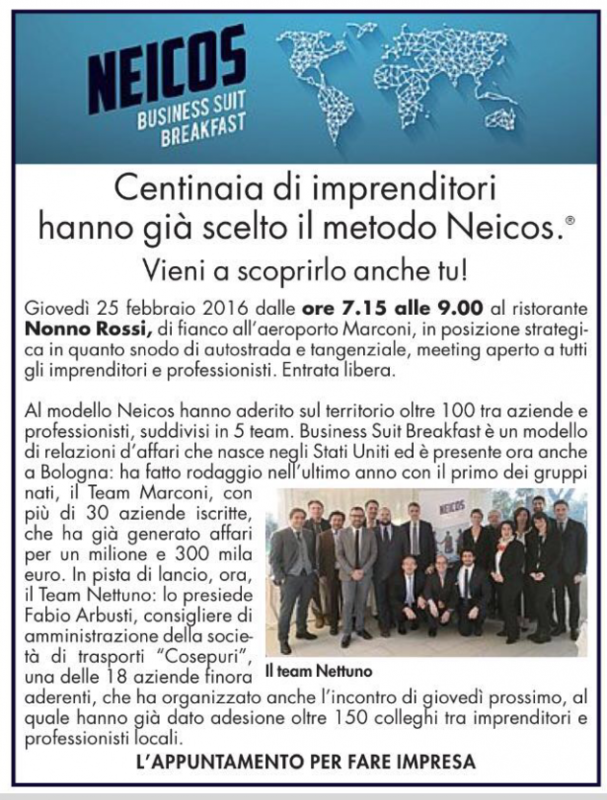 In order to understand how it works, it has been organized a unique event open to everybody on Thursday, February 25 (exceptionally at 7:15 AM, for organizational reasons), in the meeting room on the second floor at Nonno Rossi restaurant, next to the Marconi Airport, in a strategic area close to the highway and the ring road. More than 100 local businesses and professionals joined to Neicos model, divided into 5 teams. Business Suit Breakfast is a business relationship model that was born in the United States and is now in Bologna: last year it did the break in with the first-born group, the Team “Marconi”, with more than 30 member companies, which has already generated business for a million and 300 thousand Euro. Now on the “Neptune” Team is on the track for launch: Fabio Massimo Arbusti, Board Member of the Transportation company "Cosepuri", one of the member company, chairs the group. He also organized the next meeting on Thursday, where more than 150 local entrepreneurs will take part. "Every team - explains Fabio Arbusti - constitutes and builds a strong network of companies, with an incredible performance capabilities. The goal is clear and simple: to grow, week after week, the company's business. In essence, each team member becomes a signaller who procures opportunities for each of the other companies, by providing information, contacts, relationships. Without counterparts. In a world that moves faster and faster I believe that companies have an increasing need for new business opportunities, with methods and rapid relations based on trust, without superstructure. And without taking time and energy to the business work. " The request for contacts occurs during the weekly meetings during which each member has available a space to ask a question or to contact a supplier, a customer, a coworker. Or to develop within the team a direct relationship, entrusting a supply. A specific fact is that the team members belong to different sectors: there can only be one builder, one printing company or one engineering company an som on. And each team, at most, can count 40 members, since the meeting will not take more than 90 minutes, no later than 9 am. Why Neicos model does not take away time at work on the farm. Quite the contrary: it creates work.